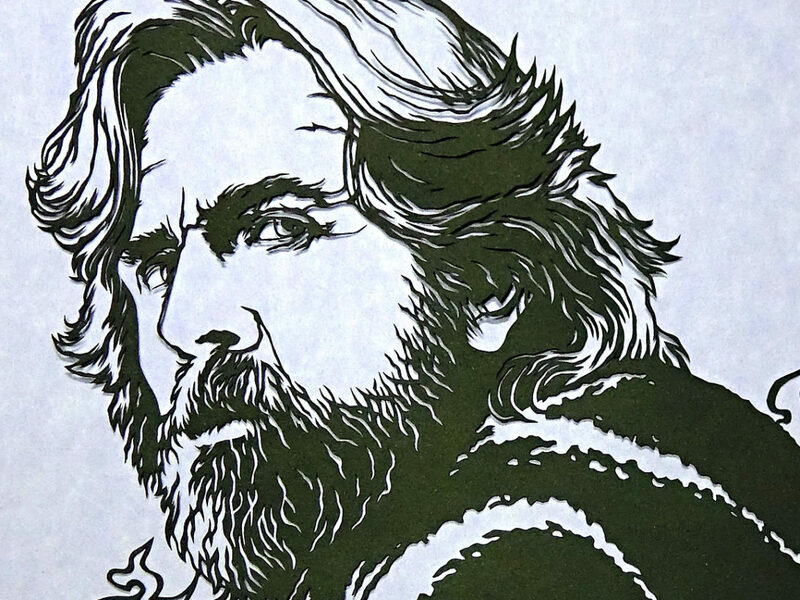 One of Star Wars‘ greatest legacies is how it has inspired fan creativity and expression. There are fan films, paintings, and action-figure photography. Homemade costumes and comics. In other words, we feel such a connection to these characters and their stories that we use our own gifts to present Star Wars back to the world in a new way. 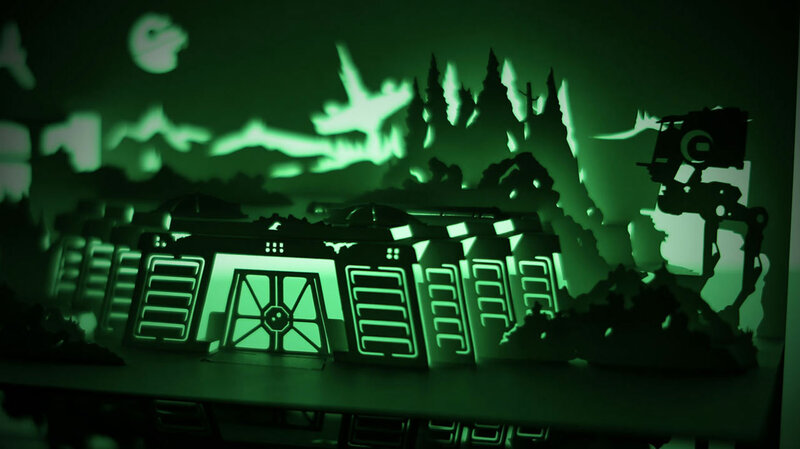 It’s really a beautiful thing, and Marc Hagan-Guirey‘s truly amazing Star Wars kirigami — celebrations of the saga’s designs and iconic moments, made by folding and cutting paper to create 3D artwork — does this legacy proud. StarWars.com spoke with Hagan-Guirey to find out how he learned the form, his process for making Star Wars kirigami, and much more. 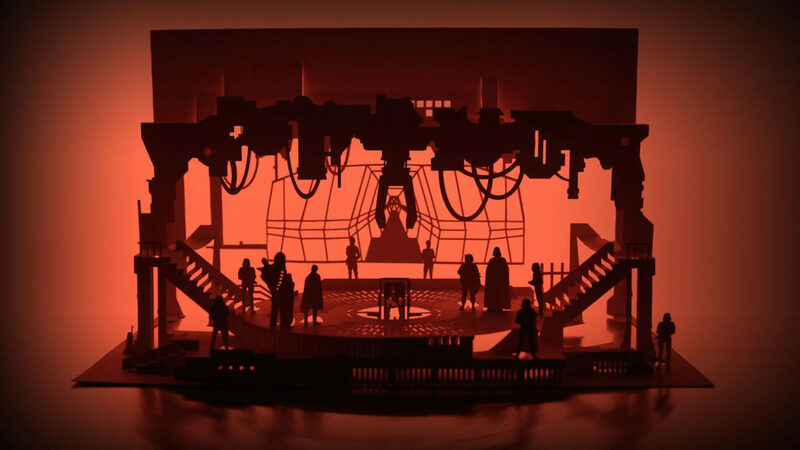 StarWars.com: So how did you get started making kirigami? Marc Hagan-Guirey: It’s a bunch of different circumstances, I guess, that led naturally to the inception of that kind of career path. I’m a digital art director, and at the time I’d been working in the advertising industry for about seven years. And I think it’s a lot of that seven-year itch, so there’s that scenario where I was getting more and more disillusioned with churning out ad campaigns, and in my head I was thinking that I kinda wanted to take a break from doing that kind of thing. And one thing I’d always missed was actually doing things with my hands. As a kid, I’d always made stuff, and when I think back… You know, we didn’t have a ton of money when we were growing up. Although my mom was able to get a hold of the action figures for me, building the actual fortresses, the fortresses themselves were things I built. So my currency as a kid was toilet roll tubes, egg cartons, cereal boxes, basically. We would trade those. So what had happened was, I had been over to L.A., actually, for the holiday with my ex-partner, and I’m a big [Frank Lloyd] Wright fan. I’m sure you know he’s a famous American architect, and I’m particularly a massive fan of a collection of houses that he did called Mayan Revival textile block houses. At the time, one of those, [the Ennis House], was on the market in L.A. A friend who I was staying with knew I loved this house, and knew that it was for sale. And it was being sold by Christie’s, you know, that really famous auctioneer. So, basically, we concocted a ruse to go in and pretend to be prospective buyers. And of course, this house was on sale for… I think it was $17 million dollars. So we ended up going down and having a look around. For me it was the closest thing to a spiritual experience I’ve ever had in my life, walking around this house. But at the same time, I was having to go, “What’s the plumbing like? What state is the electricity in?” And at the same time I’m going, “Oh my God, oh my God, oh my God!” [Laughs] But that house itself is really famous, and you don’t know it but you will have seen it in lots of movies. It’s most famous for Blade Runner. And so, Deckard’s apartment [in Blade Runner], when his car drives up, it’s raining and you see the car pulls up and then turn into the gates into his apartment, that’s the exterior of the Ennis House. 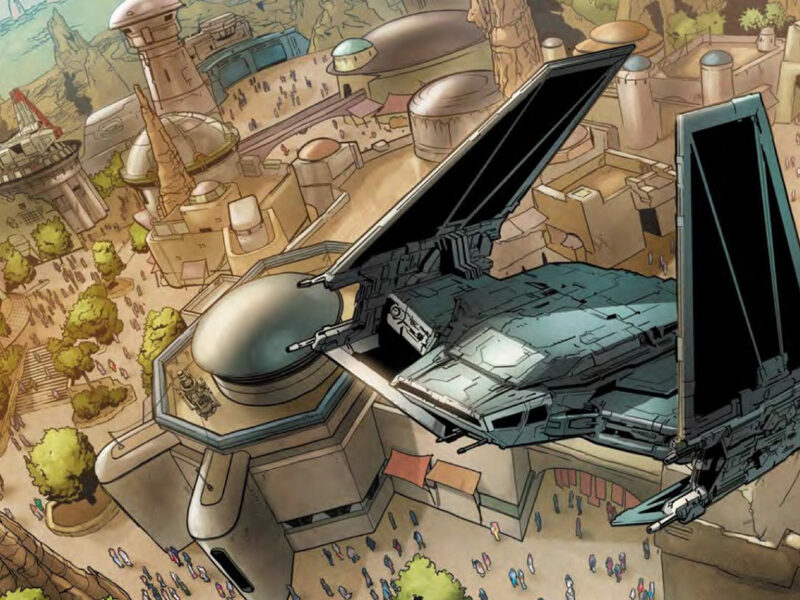 StarWars.com: I guess that’d be the downside of moving there. The second you move in, it’s gonna be raining all the time. StarWars.com: That sounds like a solid career choice. Marc Hagan-Guirey: [Laughs] Yeah, yeah, but he was really supportive. He knew I was miserable at the time, and was like, “Yeah, go for it! You know, do what you want.” So I just think at the time I hit a bit of a zeitgeist moment, I guess. People have become increasingly more intrigued and interested in stuff that’s made and crafted, and I think that’s a reaction to a very digital age, really. You even hear that in the making of The Force Awakens, as well. So I think I had a moment, and I timed it quite well. My first collection was [based on horror movies and] called “Horrorgami,” and I just sort of got a deal for the gallery, and we sort of decided we’ll start releasing bits as we get toward Halloween, which of course, people are looking for topical, new stories. 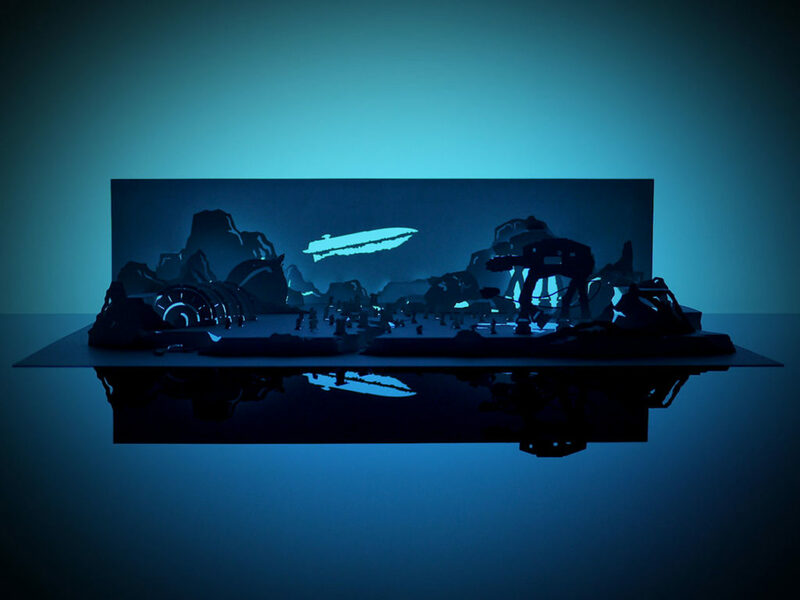 StarWars.com: So, I’m someone who can barely cut wrapping paper in a straight line. Marc Hagan-Guirey: [Laughs] Oh, no one can do that, don’t worry. StarWars.com: Okay, I don’t feel so bad. Even with the grid now that they put on the other side, I still have a hard time. How long did it take you to get to the level that you’re at now? Marc Hagan-Guirey: A lot of time was spent doing it, really. The funny thing is, I look back at the first stuff that I’ve done now, and I think, “God that looks really basic. That’s quite embarrassing, how do I get that off the Internet? Oh, I can’t, it’s everywhere.” I guess it’s constantly evolving, there’s never been a point at which I’ve said, “Oh, I’m there now.” Because I still feel like I’m on a bit of a journey, an evolution, and constantly thinking of different ways to approach a problem, ’cause basically that’s what kirigami is. In your words, to get to that level. It’s beyond creating an impression of a building or an impression of a scene. You start to see how you can solve problems in making things even more realistic or even closer to the original. So I guess from January 2012 to now, I’m still doing it and still thinking of different ways of approaching these kinds of problems. 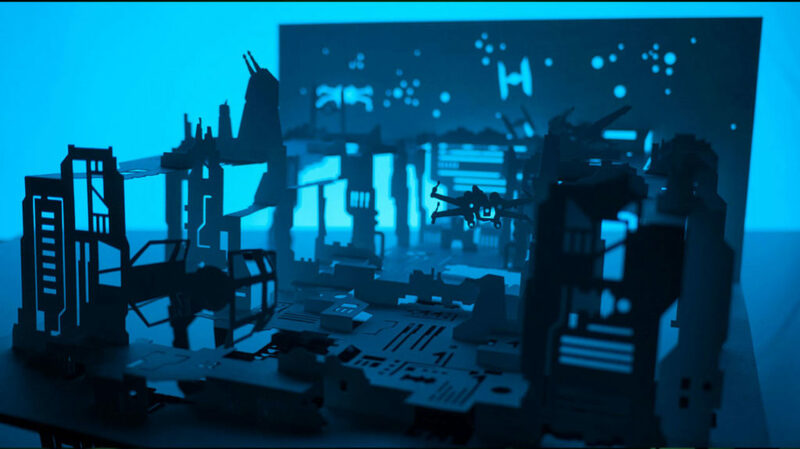 StarWars.com: What was the first Star Wars piece you did? Marc Hagan-Guirey: The first one I did was the Emperor’s throne room. One of my favorite characters is obviously Darth Vader, but the Emperor was always my favorite character. And so that was the first thing I did. 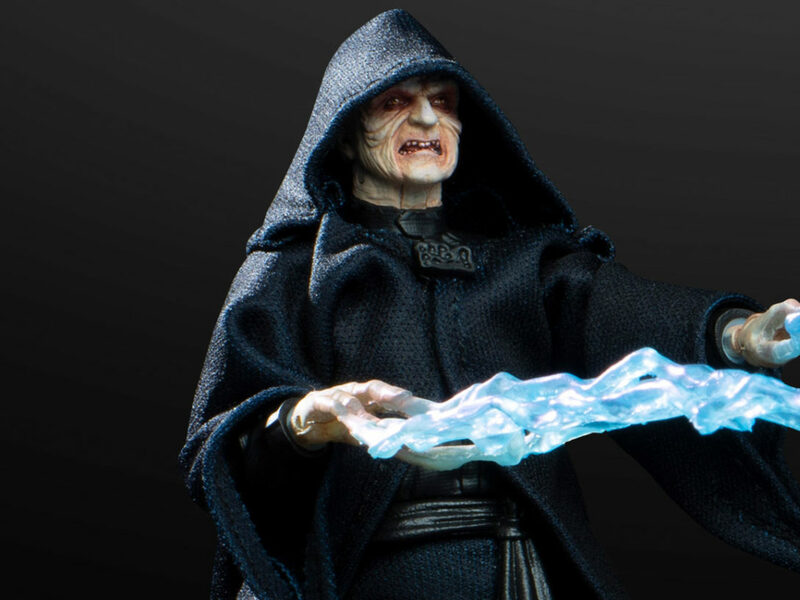 StarWars.com: It follows that a horror movie fan would love the Emperor. Marc Hagan-Guirey: [Laughs] Of course. I’m definitely dark side. When I compare the original I did for the Emperor’s throne room to the one that eventually made it into the exhibition, they’re worlds apart. 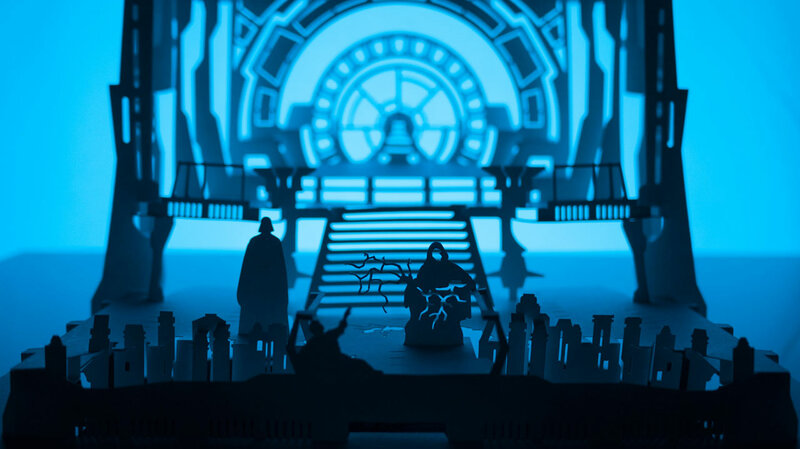 I was also working on the carbonite freezing chamber, which was the biggest pain to do in the world, because the way that kirigami works is that, when you cut something in the foreground, it has an effect on whatever’s in the background. I feel like it’s the most famous Star Wars set, really, and I wanted to get everything in there. I wanted to have the guards standing in the background, and that almost geometric spider-web-looking railing details in the background, I wanted the staircases and I also wanted to have the mechanical claw that appears above the frozen Han Solo carbonite block. If I hadn’t tried to do that, and what I would have done many years ago, it would have been nothing compared to what I ended up with. It took me five years to nail that one, coming up with different ideas and drawings and trying different things, and going through a lot of work. StarWars.com: You obviously really understand design, and with Star Wars, the design sense is really unique and specific. You know, you have the Empire, which has lots of clean lines and vertical lights, whereas if you’re going to do something related to the Rebellion, let’s say a ship, it’s far less elegant than an Imperial design would be. Marc Hagan-Guirey: The hexagonal sort of shapes and stuff, so it’s a sort of more brutal approach than the [Rebel] stuff. StarWars.com: So it seems to me, if you’re gonna do a kirigami of Star Wars, you almost have to master different styles within that, and I’m wondering how you approach that challenge. Marc Hagan-Guirey: Yeah, it is a challenge. I mean, a lot of Star Wars sets are, as you say, that kind of brutal, sort of Imperial, very graphic kind of thing. And kirigami actually lends itself to that kind of graphic approach because you are using straight cuts and hard edges and so on. But the real challenge was for me was… Actually, I find that those two married up really well, but the real challenge was in introducing more organic shapes, so kind of working on things like, you know, the Hoth battle scenes and making more organic shapes, or Endor, with the kind of foliage around the bunker. Those are really challenging for me, because you could just keep cutting it and making beautiful-minded soft edges for that, but what you would end up losing is that ability for the user to see. It still needs the overall aesthetic to have an engineered approach and an engineered aesthetic to it, so that was more of a challenge for me than doing this sort of “Imperial” kind of look. 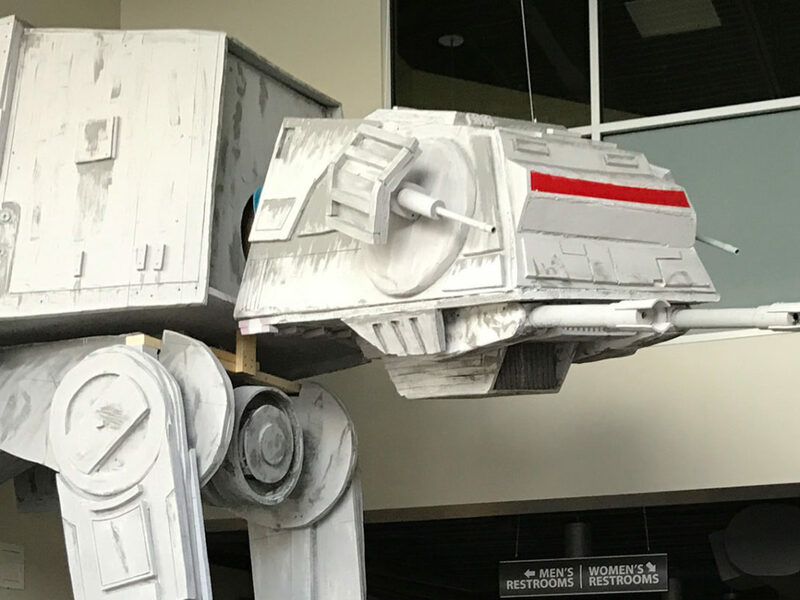 StarWars.com: When you’re tackling a scene, let’s say, for example, your Endor piece, you’re kind of capturing all of Endor, yet in a way that we don’t actually see on screen. You have the AT-ST on one side, you have the foliage, you have the bunker. So what are you basing it off of? Are you making it like how you see Endor in your head, or are you combining different scenes or elements? Marc Hagan-Guirey: Again, we’re really lucky we had such a rich resource and material. 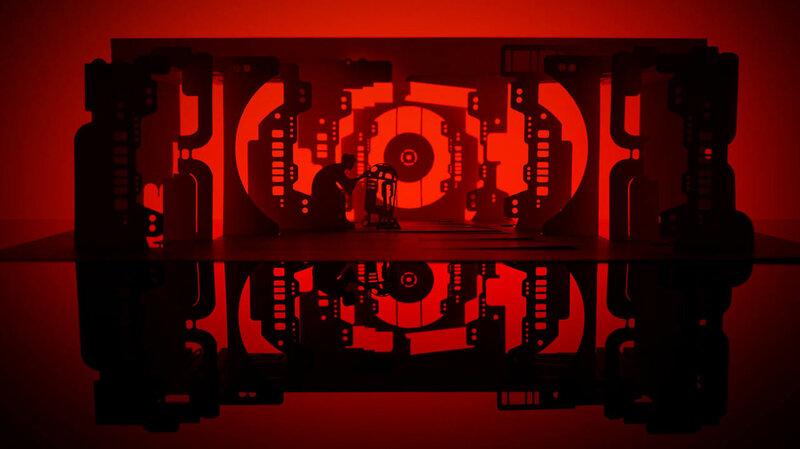 I do love architecture very much, but I’m also fascinated with set designs, especially Star Wars set designs. I’m more kind of excited to know what’s off camera or what you can’t see than what you can see. I like to be able to understand the entire space, really. Obviously, there was the blueprints book that came out and I felt like I’d won the lottery when I saw that was released. And I got the big, big version of it, with a massive hard case, I think it was limited to 5,000 English versions or something. And so I’ve become really obsessive about sets, and being able to capture all kinds of aspects in one kind of vision, and also telling stories as well. I love to be able to encompass an entire scene in just that one piece of paper. 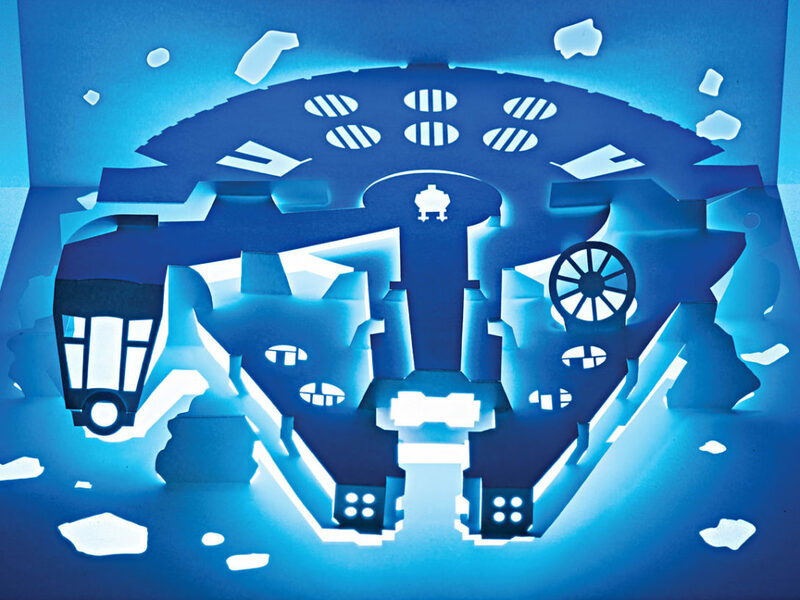 When I had people come to the exhibition and they look at the pieces, I’d listen to them and they would be talking and saying, “Oh there’s that bit, and that bit, and that bit, and this is what happened,” and they’d be able to almost retell that entire scene, you know, just from a piece of paper. StarWars.com: I wanted to ask you about what I guess I would say are my two favorite pieces of yours that I’ve seen, and they would be Princess Leia inserting the Death Star plans into Artoo, and then the Battle of Hoth. And what strikes me about them is that they’re both very different. One is kind of drilling down on a character moment, and the other is an event. They’re both telling very different stories. So how do you approach that? 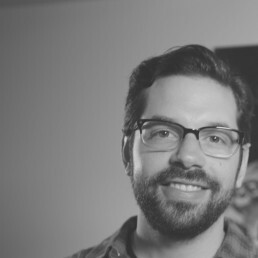 Marc Hagan-Guirey: Yeah, it’s about Star Wars, I guess, and breaking it down into the most iconic events. Those moments that you can glance at and immediately, you know, play back the entire scene in your head. And that’s how I sort of approached it, and you know, when you think of… Well, for me personally, when I think of The Empire Strikes Back and the beginning of that film, and you think of the war on Hoth. I didn’t personally think of specific moments, it just felt like that encompassed, quite neatly wrapped up that entire sort of scene and all the emotion that came with it. On the other side, with Leia giving the plans to R2-D2, it was that sort of intimate moment where, in the beginning of Star Wars, you sort of understood what was going on very quickly. Because immediately you face a huge Imperial Star Destroyer going overhead, and you know the threat, and very quickly after that you can see the very soft and human side of who’s fighting against each other, and that very much set the tone of Star Wars. So I think it’s setting the tone of different parts of Star Wars and how you can kind of immediately get that across to a viewer. StarWars.com: Right. 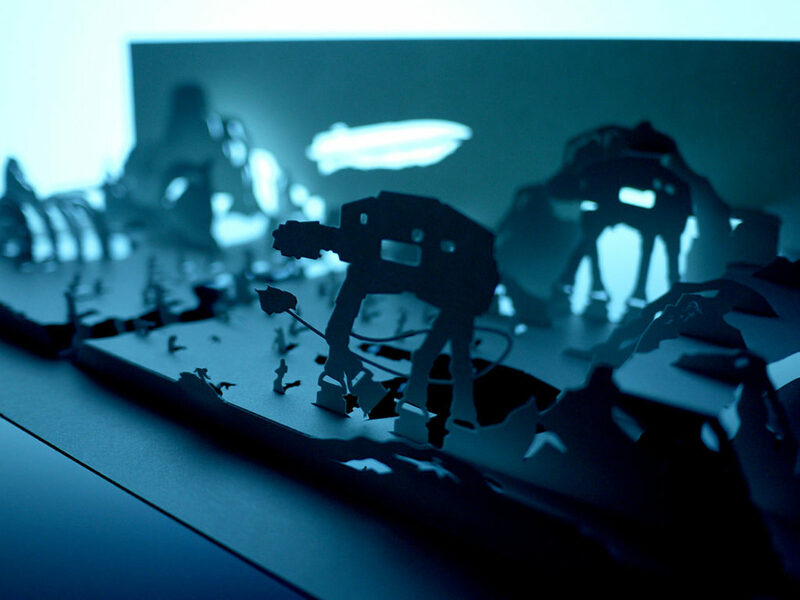 One of my favorite bits of the Hoth battle kirigami is the fact that you actually have a snowspeeder roping an AT-AT. I look at that and I feel like it would drive me crazy to try and cut that out myself. Marc Hagan-Guirey: I didn’t do it just once, I did it many times [Laughs]. But that’s essentially the secret to this. I love that people do ask me, “So do you always get it right the first time?” and I probably should say yes. The reality is, though, that I muck it up all the time, and when I do it, it’s not a case of me just going, “Oh well, I’ll just get back on to another one now.” I pretty much clear my desk and throw a massive tantrum, get up from my desk, stomp off, go have a coffee, 20 minutes later come back and sit down again, and start again. So yeah, it’s practice really, you know? When people suddenly present the style of what they’re working on, people assume that they just have this natural talent to do it. You have to work at something for a long time in order to be perceived as someone who’s an expert in it. I was really chuffed, actually, with that little moment put in there as well. The paper is very delicate, and you want to be able to have the cable going around the legs, and just getting that balance right, making it not too thin, making sure it doesn’t rip, and getting the perspective of it right. One thing that I do mix quite a lot is perspective; it’s not just kind of an isometric view or from elevation view, there’s lots of different things going on. There’s things cut from different angles. For example, the snowspeeder, obviously you can see that was cut, but in a way that it’s dynamically flying. It’s on an angle, it’s not just the shape. And then you scan over to the shield generator, and that’s very much a kind of front-on thing, but my approach with designing these things is that you don’t want to get it all across in one. That’s kind of contradictory to what I just said, but what I mean is, your eye goes on a little journey around it, in much the same way that film is made. You have multiple shots and multiple angles to tell the story. 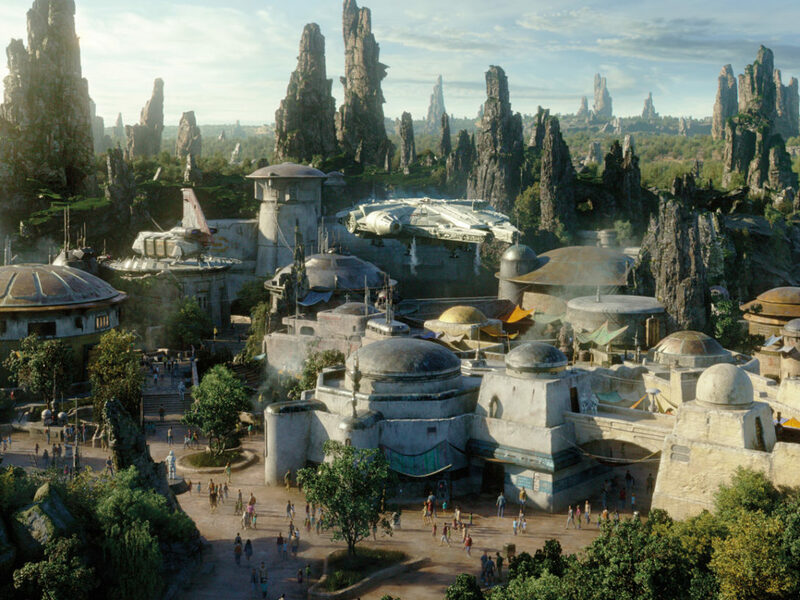 On one side you’ll be over looking at the shield generator, which is front-on, and by the time you journey over to the snowspeeder, you’re in a different shot. And it’s okay to mix up the perspective of it. 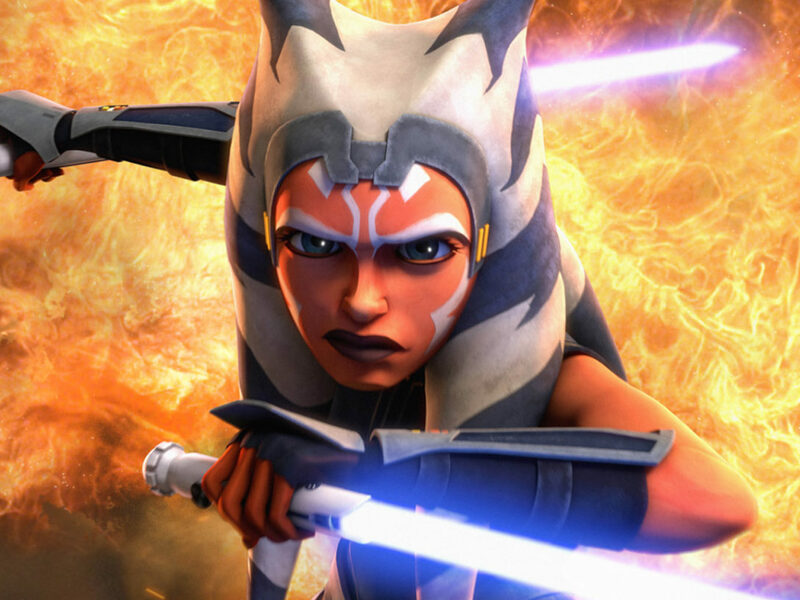 StarWars.com: I have one last question for you. 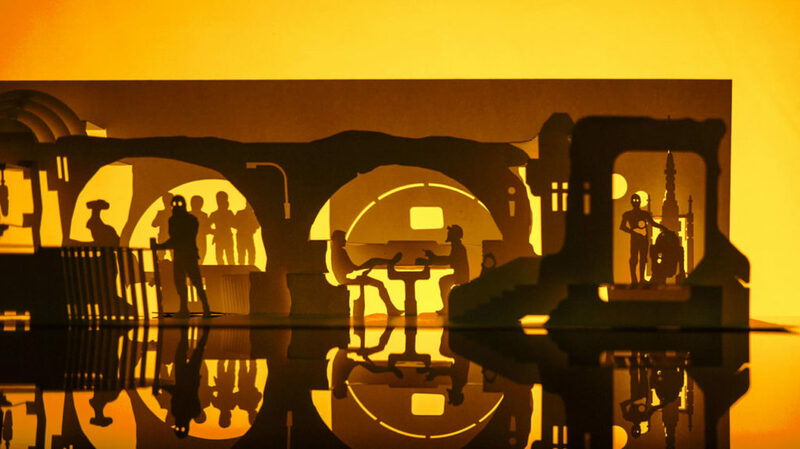 Let’s say Jabba the Hutt commissions a kirigami piece from you. He wants a self-portrait. How do you make it flattering? Marc Hagan-Guirey: Oh my goodness. [Laughs] I think… What would I do? Oh my goodness. I think I would probably make it so tiny and sell it to him with the concept that this is so precious and so small, and just make a really huge case around it. And I’m hoping, you know, he’s got those huge eyes, so his eyesight isn’t really that great. Either that or it’s… no, that’s the one, that’s what I’d do. 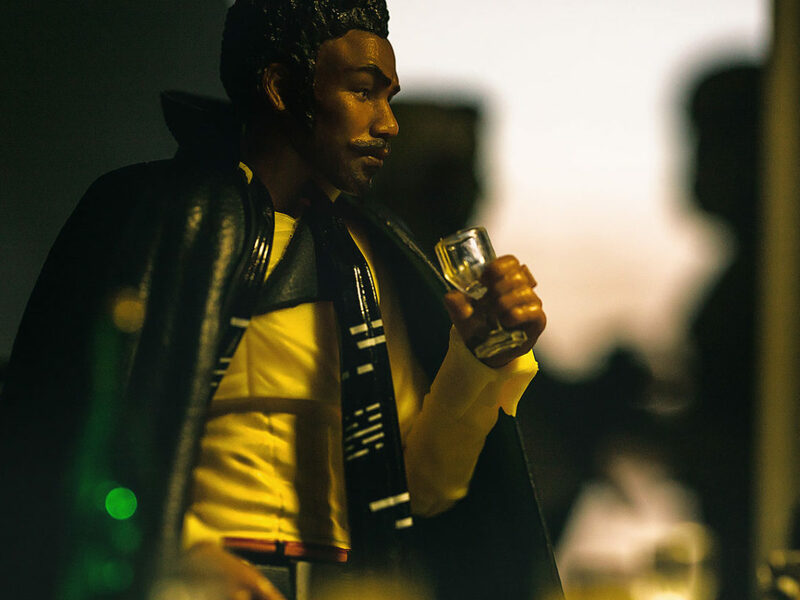 StarWars.com: I like that. It represents how powerful he is. Marc Hagan-Guirey: Yeah exactly. That’s him, and the rest of it’s his kingdom. So I think that that would be it and I’d hope that he’d love it.